CST to unveil the Dual Test Socket 2133Mhz DDR3 DIMM/SODIMM Tester at the Semicon Taiwan Show. CST Inc., a 30 years privately owned Memory Tester Company has announced its New Eureka Express -DDR3 2133 Mhz DIMM/SODIMM Tester and have started deploying multiple units of the DDR3 2133Mhz Memory Test Solution at several major OEM Memory Manufacturers world-wide. The new Eureka Express-DDR3 2133Mhz tester is capable to test the PC3-6400 (DDR3-800Mhz), PC3-8500(DDR3-1066Mhz), PC3-10666 (DDR3-1333Mhz), PC3-12800 (DDR3-1600Mhz) ,PC3-17066 (DDR3-2133Mhz) Long DIMM Memory Modules and SODIMM modules. With a simple push button, the Eureka Express - DDR3 tester quickly auto-identify and displays the memory size , clock frequency, speed, Unbuffered memory module. It even reads and programs SPD EEPROM on the DDR3-SDRAM DIMM. 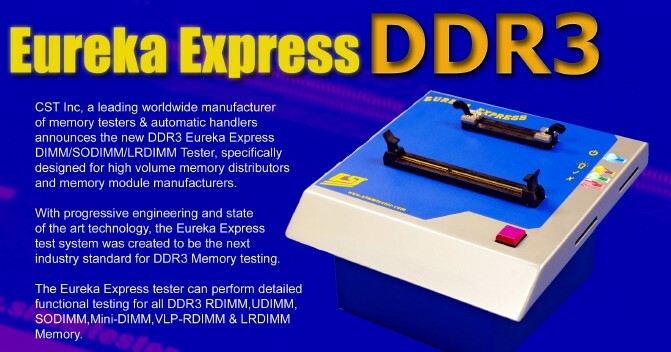 The New "Eureka Express 2133 Mhz DDR3 DIMM/SODIMM" tester provides added troubleshoot capability for the present and future DDR3 memory modules at affordable prices. It is targeted for the DIMM/SODIMM manufacturers, computer integrators, memory distributors, and service depots. It is indeed the fastest tester and the easiest to use in its class. 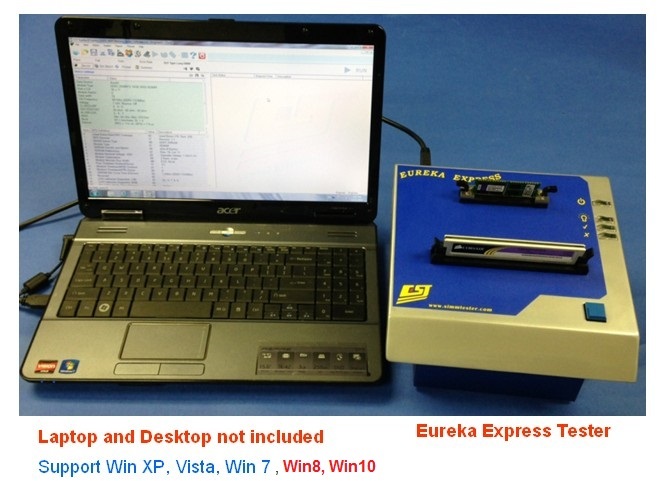 A desktop PC or Laptop is required for interfacing with the Eureka Express. CST, Inc. headquarters in Dallas, Texas as well as global distributors strategically located in Australia, Brazil, Canada, China, France, Germany, Hong Kong, Japan, Korea, Switzerland, Sweden, Singapore, Taiwan and the United Kingdom.